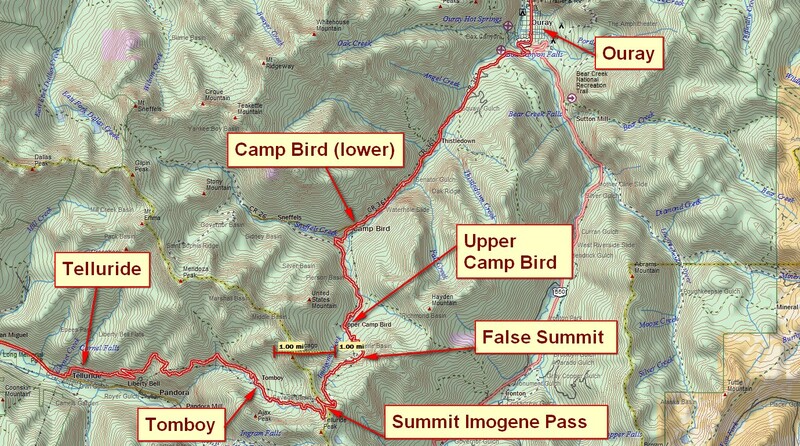 Here’s Part 2 of the ride over Imogene Pass from the Ouray side to the Telluride side. This video covers from Upper Camp Bird to the false summit. I say “false summit” because from down below it appears to be the real summit—that is, until you get there. The video starts with a brief overview of the GPS track, and then takes the trip up the hill in real time. The video was taken on 5 Sept 2012 around sunset, so the views are stunning. There’s almost no air pollution at this altitude. Video runtime is about 9-1/2 minutes. The road from Upper Camp Bird to the real summit is close to a 15% average grade (for every 100 feet forward, 15 feet up), and in some place is much steeper. Part 1 can be seen here and Part 3 is coming. Also, I’m including the GPS track here so you can follow along. Click “continue reading” to see it. Imogene Pass GPS track from Ouray to Telluride. This is the first map shown in the video. See the copyright notice both in the video and at the very bottom of this page regarding the base map.